I've been given that advice countless times - even more than "Keep your wrist up," "Don't drop your guard", "Move - faster - vary your speed," and "Lunge!" So I'm quite pleased to know that the Sunday Express, in a screaming front-page headline, wants me to be banned. Well, the story doesn't actually mention me. It's about youths in hoodies terrorising neighbourhoods. But it calls for hoodies to be banned from shops, shopping centres, public transport, high streets and other public areas so that people can walk safely. My fencing club has an elegant hoodie. It's black with gold lettering and logo - and I don't just wear it between bouts. 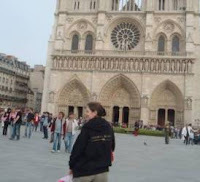 I wear it when shopping and travelling - even when working. It's an easy garment to wear and much easier to wash than a cardigan or jumper. But hoodies have already been banned from one shopping centre and will probably be banned elsewhere. The danger is, apparently, that the hood can be pulled up and might even shield the face from CCTV cameras. It's not a new problem. Fencers have worn some pretty elaborate headgear in the past. Judging from this statue of d'Artagnan (it's in Maastricht) concealing headgear and a propensity for violence go pretty well together. And, worse still, fencers have a tendency to face their opponents while masked. I wonder how long till the Sunday Express calls for a ban on the fencing mask. Perhaps they will use their favourite phrases about a "nanny state" culture and bureaucracy gone mad and urge a return to the good old days when a duellist really risked death but could see the person who was about to kill him. Lately I've been better at wearing a hoodie than fencing effectively. A bad cold tempted me to stay home last week, but I determined to fence anyway. A 25-minute walk - or rather limp - in heavy rain wasn't good for me, but I was more worried about my swords. At least I didn't need to rush. We now have the hall for an extra hour. There was even plenty of space and a shortage of foilists and sabreurs - some sabreurs had been persuaded to join the foilists in a friendly tournament against a neighbouring club. I tried to take advantage of the extra space and time but it was one of those evenings when I felt the wrong size and shape for fencing. The chef is on holiday, so there was less chance for laughter. Instead the other epeeists - all men - handed out helpful advice which I couldn't follow. I felt woozy and my foot hurt. I picked up a fair number of bruises and landed few good hits. I wasn't the only fencer who left early. The beginners, the foilists and sabreurs packed up early. I asked one of the coaches if he could give me a lift home. When we left, four epeeists remained. They had the hall to themselves and were fencing steadily. As I waved goodbye they looked as though they could continue for ever. English pubs aren't quite like they seem in the movies. That's a shame. I'd like to report that the fencers led the assembled drinkers in a song and sword-dance until the pub was filled with tunefully drunken jollity. Some picturesquely criminal types and a melodramatic plot would have livened the evening further. But it wasn't like that. The pub was quiet - no music at all, so far as I remember. A few fencers sat at a table discussing plans for the Easter weekend. At work, everyone except me seemed to be headed on holiday but the fencers in the pub were a stay-at-home bunch, apart from one who had a fencing tournament planned. One thought he might go to the garden centre "to buy some more plants to kill during the year" but that was about as exciting as it got. The beer was good and, as the conversation drifted, I recalled the evening's fencing. Again the hall was crowded but it may be as well I didn't fence that much as I'm still supposed to be resting my foot. And conversation while waiting for a piste was lively. At the beginning of the evening, I felt I was having a splendid run. I was landing hits as I intended - not the majority of hits but, when I broke through my opponent's guard, I managed hits that felt less clumsy than usual to the arm, wrist, hip and thigh. I felt faster and more confident. My opponent generously greeted my best hits with "well done" or "nice one." Maybe he was giving me opportunities but at least I was taking them. It seemed as though my inability to move fast was at last paying off in improved point control. When I stepped off the piste, however, a fellow fencer helpfully pointed out a problem with my guard and the way I was lowering my wrist as I moved in to attack. This probably explains the bruise on my wrist last week. I asked the helpful fencer to show me help me get my guard right and determined to attack without exposing my wrist in future. Of course, by the time I came to fence the chef, I couldn't get it right at all and was slowed by trying to correct the mistake. I consoled myself with the thought that she is less than half my age .. but it would have been more consoling to land a lot of hits on her. After we'd stopped fencing, I worked hard at persuading the chef to join us in the pub. I pointed out that I hadn't been to the pub after fencing for ages - and she was planning to go on holiday next week (an exotic foreign trip which for some reason involves no fencing at all.) She insisted on cycling home to change first and I wasn't sure she'd come, especially as it was a cold evening. But she arrived, late, and more elegant than the rest of us, in some very fetching brown, high-heeled shoes that evoked an previous era. But the chef is leading a double life and, when she's not indulging in swordplay and baking she stays up late writing her thesis and other academic articles. Her handbag (also elegant) concealed a newly-published book with an essay she'd written. The book looked splendid, with clear typeface and pleasant layout, and the article, as well as impressive footnotes with quotations in French and German. One footnote outlined eighteenth century aesthetic theories about male anatomy and at least two discussed Immanuel Kant. I suspect that few - if any - movies show fencers discussing Immanuel Kant over beer in a traditional English pub. I can't think why not. I'd like to see a film with lots of fencing and philosophical discussion. It would be in the great tradition of realist cinema. I thought for a moment we'd converted a sabreur. There he was, standing by the piste, epee in hand. Perhaps he'd seen the error of his slashing ways? But no. Conversation revealed that he'd started with epee, moved on to sabre, but thought he'd fence epee once in a while to keep in practice. It was a shame but at least there was a chance for conversation. Even though attendance wasn't quite as high as in the past few weeks, we were still queuing for the electric pistes - and I'm still supposed to be resting my foot. Anyway, I was curious about this fencer as I'd seen his Facebook page and knew he trained at the Royal Ballet. 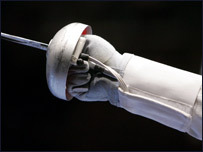 There are clear connections between the skills required for fencing and those needed for ballet, as one of the coaches says. It's easy to recognize the ballet-trained beginners - they're the ones who don't quiver when asked to stand on their toes.bend their knees outward into a demi-plie, and hold the position for a minute or two. They have accuracy too and a high level of bodily control. But I didn't just want to talk to him because he was a good fencer. I enjoy watching ballet - not so much as opera but still with the immense pleasure that comes from watching people make years of training look easy as they enact deep emotions. They do swordfights too - the photo shows Jonathon Byrne Ollivier of the Northern Ballet Theatre as Athos in the ballet of The Three Musketeers. The dancer had spent four years in professional ballet - from cabaret in Zurich to a stint as a dancer with the English National Opera - before injuries forced him to give up. These days he's a nurse, putting the knowledge of physiognomy all dancers gain to a useful purpose. But he lit up when he spoke of dancing and assured me he regretted nothing of his short career. I recalled ballets I had seen from the Gloria which uses Poulenc's music and imagery from the First World War to the pure delight of Ashton's choreography for Fille Mal Gardee. This led the dancer to speak of his love of Bournonville's choreography - and as he reminisced he almost moved into the bouncing leaps that are the Danish choreographer's trademark. The conversation was cut short when the piste became free. We connected and tested our swords, saluted and put on masks and began to fence. The dancer was a joy to watch but at least I knew there was no hope of outdoing him in grace and speed. I had two hopes. I could cut through his elegant fencing and land the occasional hit by being direct and inelegant. And I could hope he fenced like a sabreur, guarding above the waist and pausing to establish right of way. I managed more hits than I'd expected. But of course I didn't win. And that's not just because my foot hurt, cutting my speed further. I tried to focus on bladework and did my best. But I had no hope against the strength, speed and precision of a dancer. What's worse - I have a bruise on my wrist, suggesting a fell into the error of letting my guard slip. And if any fencers doubt the skills of ballet dancers, watch strength and precision demanded by this brief piece of Bournonville choreography, danced by the 18-year-old Johann Kobborg. What a fencer he would make. "Are you sure you should be doing this?" the chef asked, as we lined up for footwork practice. There wasn't really enough space. Yet again there were 40 or 50 fencers in the hall and most were lined up, trying to follow the coach's instructions without tripping over one another. Luckily it was a short practice just varying speed and length of step with the occasional lunge and recovery. It probably wasn't wise, but I shan't feel the pain till tomorrow. My foot still hurts and the doctor did tell me to rest it. I have rested it. (When I sleep I rest it for hours at a time.) Fencing is a great deal better than not fencing. And fencing with lunging and movement is much better than standing still and trying to parry. Perhaps I say that because I'm not very good at parrying. Doubtless the practice has been good for me. Yet again there were queues for pistes. After Easter we're to have the hall for longer which should resolve the situation. As it was, the chef and I spent most of the time fencing steam, though we took out turn on the electric piste for epeeists. For some reason, the chef insisted we do foil as well as epee, just so that we could remember how to do it. But I don't remember how to do it. I tried to recall how to parry a foil, how to get right of way, what the target area was. The pistes seemed narrower, though perhaps my clumsiness was to blame. On the electric piste, I was too close to the sabreurs, who seemed even more exuberant than usual after their successes in the recent Open. I was trying to be exuberant too, I've worked out that if I take enough exercise, I can't feel the pain in my foot any more - and that must be a good thing, mustn't it? ("You mean it's numb," the chef said critically.) I wasnt very successful but I got some hits and at least I was moving backward and forward and managing some lunges, though they weren't very deep. I tried some tricks and actually got a couple of hits by coming en garde in the low line and then raising my blade ... until the chef worked out what I was doing and hit me on the wrist. I tried some energetic parries and a few more odd blade positions - that's when I hit the ref. She wasn't our ref. - she was reffing the sabreurs on the next piste, and perhaps I did no more than catch the body wire which wasn't properly tucked in her breeches' back pocket. I don't know what the penalty is for stabbing the ref. - or whether a ref. on an adjacent piste can impose a penalty. It wasn't a proper bout anyway - just a knockabout. I lost the only scored (steam) bout that I had, against one of the male epeeist. He won 15-8, which would be a good score for me if I didn't suspect that he was deliberately leaving his forearm open for me to hit. Sometimes I missed. The chef reffed and I didn't stab her, even when I wasn't sure about the point. When I reffed the short bout that followed (curtailed by closing time) I was too tired to see the blades clearly. They flashed and blurred and I wasn't sure where the hits had landed. My foot suffered twinges and the last half-mile of the walk h ome made me wonder if I'd been wise to fence. But I don't regret it, even though there may be pain tomorrow. It's getting better. My "policeman's foot" (or plantar fasciitis) only hurts a little, when I've been walking for half an hour or so. I can put weight on my foot when I get out of bed in the morning and I can stay on my feet for a while if it's required. I've been careful, however. I didn't wear my highest heels to work. I stopped running up and down stairs, and limited excursions from my office. Taking my place on a peace stall at the weekend, I stayed for a mere half-hour, leaving when a fellow Quaker arrived. I'm hesitating about the peace march in two weeks' time. Perhaps I'll find a way of reaching Aldermaston on Easter Monday. Campaigning for peace can involve an awful lot of standing and walking. At least I managed a little fencing. Walking the mile and a half to the leisure centre was painful and it was embarrassing to explain that I would fence as much as I could from a stationary position. It seemed quite an imposition. There were more than fifty fencers. The beginners remain enthusiastic while seniors were preparing for a big, local Open. I fenced a couple of epeeists who did their best to fence down to my level. I didn't do well but any fencing was an achievement. I wanted to watch the Open this weekend but I've too much to do and I'm not sure my foot would benefit from the long bus journey and the standing. There won't be any seats for spectators. But somehow I've got to get some exercise. I'm determined to fence properly - footwork, lunges and all - next week. My breeches are dangerously tight. Note: The chef alerted me to a spelling mistake which I have now corrected. There is an interesting footnote on the relationship between "stationary" and "stationery" here.